Great location & amenities! Very comfortable space, easy to get to and convenient parking. Clean commonplaces and workout/pool area. The unit was clean and well kept. We enjoyed the spread out space as well as the three outdoor balconies! Family holiday vacation! Thank you so much for such a lovely place to stay in for a family vacation! We had all of our children and grandchildren with us for a family ski trip over the New Year's week-end, The house accommodated 8 adults & 4 little ones very easily. The convenience of the location to all ski areas was great! Amazing views with convenience of being close to town. Cabin was absolutely beautiful and had the most amazing views! In a neighborhood of very nice homes but spaced nicely with plenty of privacy, and just minutes from shopping and skiing. Loved enjoying the fireplaces and game nights with Foosball and darts. Great view and location. Host was easy to communicate with and very responsive. Only issues were no fitted sheet on bed and the bath mats were very wet when we arrived. These issues were quickly addressed by Ski Colorado so it worked out in the end. So Clean, Spacious, and Comfortable - Perfect Location. We loved this property - home had all the amenities one could hope for and is located in a perfect central location to the ski areas and town. The instructions were clear and made the whole rental experience completely stress-free. We will stay here again! Beautiful cabin, perfect for a big group and cozy. Everything we wanted in a cabin. Great location and stay for a couple or small family. Having the kitchen was great for breakfast. Would book again. Cozy studio is perfectly situated near lifts and everything happening on main St. Plus if it's too cold the bus system picks up just across the street. It was very clean and the multiple hot tubs were highly appreciated. We loved staying here. Everything was very clean and comfortable. It was decorated for Christmas as well. Everything was labeled which was also helpful. The location was great too. Close enough to downtown Breckenridge but far enough to feel remote. There was some road noise but overall I recommend staying here. 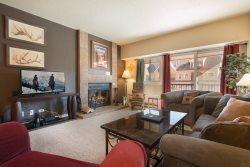 An excellent location with everything you'll need to make yourself feel at home on the slopes.